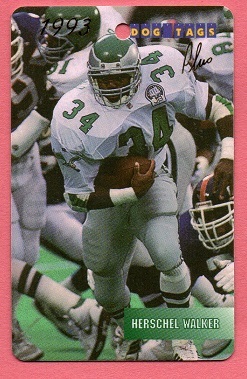 THE HERSCHEL HOARD: Top Ten Most Wanted Herschel Walker Card CAPTURED! Top Ten Most Wanted Herschel Walker Card CAPTURED! A very happy day at the Herschel Hoard, as I was finally able to cross one of my Top Ten Most Wanted Herschel cards off the list. The Walker example of the 1993 Chris Martin Enterprises Dog Tags set, is one I have been seeking for years. 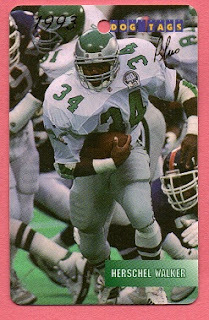 I saw other players in this set from time to time, but never Herschel. 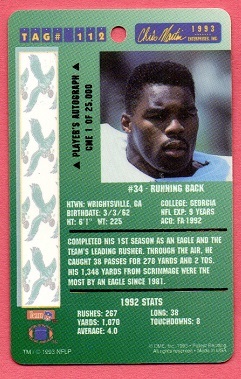 The fun thing about chasing these cards, is that you just never know when one you're looking for will pop up. I get updates from sites like EBay, when new Walker cards are available, but it seems like you can go months without seeing something you need. The 2018 Panini set was a different animal. Because it was a new set, the secondary market had many cards available, and I struck while the iron was hot, in that case. But for older Walker cards, they can be almost impossible to find. Coming across one of these, at a good price to boot, is what I enjoy the most. This card has been officially removed from the Top Ten Most Wanted List, and replaced with a new card, the 1997 Stadium Club One of a Kind #138. Congrats on finding the tag!